37.5 mm 18K white gold case set with 60 brilliant-cut diamonds - 1K, onyx cabochon crown, diamond bezel, matte black dial set with 5 brilliant-cut diamonds - 0.11K and 5 navette-cut yellow sapphires - 0.09K, self-winding movement, approximately 42 hour of power reserve, black satin strap, 18K white gold buckle set with 80 brilliant-cut diamonds - 0.49K. Water resistant to 30 meters. 37.5 mm 18K white gold case set with 60 brilliant-cut diamonds - 1K, onyx cabochon crown, diamond bezel, black dial with an 18K white gold camellia set with 278 brilliant-cut diamonds and 7 brilliant-cut diamond indicators - 0.9K, self-winding movement, approximately 42 hour of power reserve, black satin strap, 18K white gold buckle set with 80 brilliant-cut diamonds - 0.49K. Water resistant to 30 meters. 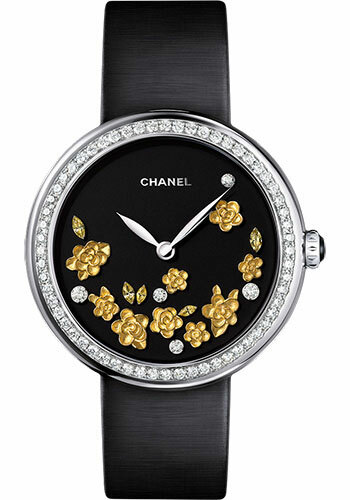 37.5 mm 18K white gold case set with 60 brilliant-cut diamonds - 1K, onyx cabochon crown, diamond bezel, mother-of-pearl dial set with 330 brilliant-cut diamonds - 1.02K and decorated with a camellia in mother-of-pearl marquetry, self-winding movement, approximately 42 hour of power reserve, black satin strap, 18K white gold buckle set with 80 brilliant-cut diamonds - 0.49K. Water resistant to 30 meters.